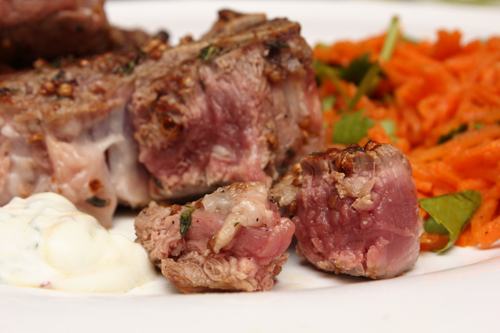 An important trio of tastes made me a winner here: sweet carrots + tangy yogurt + rich lamb. I doubled the amounts for the “Coriander-Thyme Lamb Chops with Yogurt Sauce” and the “Carrot and Cumin Salad,” from the May 2015 issue of Cooking Light, in order to feed the three of us, although I held back on the amount of yogurt sauce. Cooking Light is cute about creating a “game plan” for a meal. I customized my own plan, of course, to create a quick and lovely dinner. Lamb chops are an expensive treat, indeed -- so easy to marinate and “grill” on my stove top. I cooked these chops rare; my youngster was sucking on the delicious bones. First, I grated the carrots in my food processor, then blanched, drained, and dressed them. Next, I prepped the garlicky yogurt mix. This became a surprising blast of flavor, with the garlic, lemon juice, mint, honey, and red pepper. For the lamb marinade, I “crushed” the coriander seeds with a quick pulse in my electric spice grinder. The coriander and the thyme became a winning combo. Rubbing the lamb chops with cut garlic cloves was actually quite effective as a flavor boost. Success was mine. We enjoyed this meal. Next time, I want to cook the “Braised Chicken Thighs with Potatoes, Porcini and Dried Cherries,” from the May 2015 issue of Food & Wine. Get your cast iron pan and come back to my site next week, to enjoy this one with me.